One a day challenge, getting back to it. After a conversation with my friend and fellow photographer Nate Allred, ( http://treasurephoto.net ) I decided to get back onboard with my one photo a day challenge. I must admit, the challenge is much more difficult than I originally thought it would be, but I did love doing it, and it is a great way to sharpen my skills, and stay on top of my game. 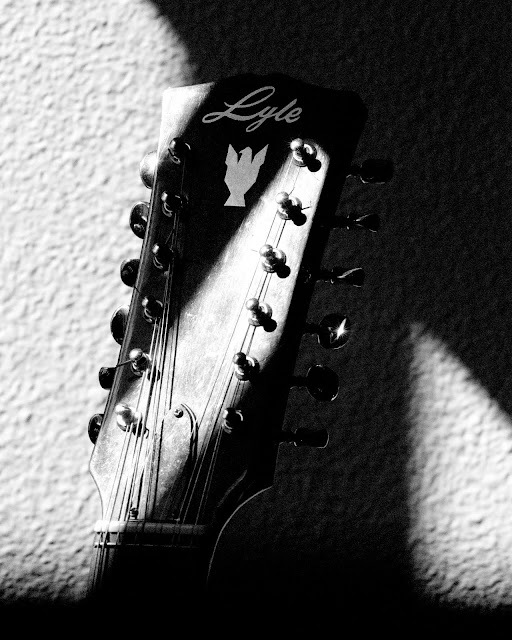 I was playing with my camera this afternoon, and noticed some interesting shadows caused by the window blinds on my 12 string guitar. I thought that would make a great black and white photo. This next part gets a little technical for the non photographers, Sorry. I wanted it to have a heavy grain texture to the print, something that looks like the old Kodak tri-X 1600 film, so I set my Nikon D60 to the ISO setting of Hi-1. This is an ISO equal to 3200. In a color photograph, this setting creates an unusable photograph because the noise levels are so increadibly high that the image looks nasty. However, in a black and white photo, instead of noise, it looks like film grain, which is at times beautiful in a photograph. Earlier this week, fellow photographer Scott Bourne said “grain is the brushstrokes of photography.” And I couldn’t agree more. I wanted to maintain as little depth of field as possible, so with that high of an ISO, it required a shutter speed of 1/4000 sec and an aperture of f 7.1. After shooting it, I took it into lightroom and added a little contrast, otherwise it is right out of the camera like that. I do love shooting black and white. I have ever since I first printed my own pictures in a darkroom. I hope you enjoy this print. Please feel free to write a note below, and let me know what you think. I love to get feedback, good or bad. Posted In: black and white, california, fine art, Inland Empire, photographer.